I am leaving for a couple of days to go visit a friend in Pazardzhik. It is about two hours away from here by train. She is a teacher so I will spend some time in her school and then just seeing yet another Bulagarian town. Poor Mark. he’ll be so lonely. He’ll have to do all the dog walking and food preparations on his own. I wonder how he will manage??? 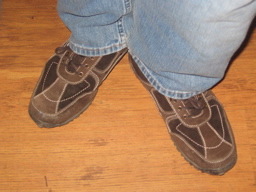 These are Mark’s new shoes. European size 43. He feels like he fits in a little better with such Euro-style shoes. Now, if he could just learn a little more of the language! This is our Monopoly game. 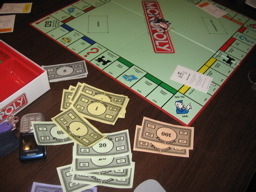 Except that it’s a British Monopoly game, so instead of Boardwalk, they have Mayfair Park, or something odd like that. And the money is always in pounds. 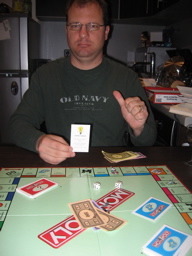 Mark always beats me because he buys up all the cheap land and puts houses and hotels on them. Then he just sits back and watches me lose all my money. But not this time! I finally beat him. The second picture shows all my winnings. He had NOTHING left. Heh! We found a way to order takeout…in ENGLISH. Woooohoooooo!!! And so we did. 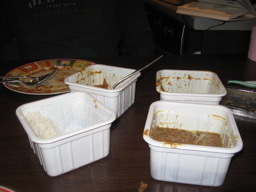 We had Indian food…nan, dal, vegetables, chicken curry. Delicious. The food here is fresh, but not so spicy. So the Indian flavor was a nice change. You can see Mark really enjoyed it! Well, I’ll be back in a few days, probably with another batch of pictures. until then….beeeehave! 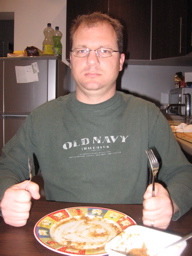 Hi Kristy, how are you? Thought about you this week as we begin our live animal science unit. We just got the new lizards…I hope we don’t lose this batch. Anyway, have you heard…we will probably have 6th grade next year. Some 5th graders have already asked to have you as their 6th grade teacher. Well, what do you think?